A: Cap pulls with the faintest of hisses, and the cork releases no sound to speak of. The copper hued nectar pours lifelessly into the glass, with only thick chunks of sediment to break the monotony. S: Sweet-and-sour sauce, fish sauce, and cherry cough medicine are all unpleasantly invited to the bouquet. T: Cloying sweetness is exacerbated by the sickly sourness of the brew, which gives one the impression of drinking hoisin sauce. Off flavors run rampant in this brew, with cherry cough drops, solvent, and band-aids being most noticeable. M: Thick, sticky, lifeless... what a mess. D: Whoever dubbed this brew a gueuze should be shot. This is easily the most poorly executed brew I have come across since Cave Creek Chile Beer. Avoid at all cost. Pours a tobacco and rust amber that was still clear. Very quick head, but pretty good bubbling. The aroma has some definite funkiness. Makes me think of a kriek along with cocktail shrimp and cocktail sauce. The taste has a funky and middle of th road kriek flavor. Like some old cherries just a day away from being unedable. utlets not forget the cocktail sauce and shrimp flavor at the end. The palate is tart, but fruity and weirdly funky. Glad I tried this beer. But will never buy again. I found this 12.7oz capped and corked green bottle at Sal's Liquors in Addison, IL for $4.99. My bottle labels itself as Winter Guezue rather than Christmas Guezue, although Santa Clause is definitely on the front label. No bottled on date on mine. The beer poured a dark apple juice color that had some pinkish tinting to it when held to the light. There was absolutely no head and no lacing, but there are a gazillion bubbles and you'll get lots of unattractive floaties if you're not careful with your pour. This is a very earthy smelling beer. It has a little Belgian funk to it, but it mostly smells like wood and a rosin bag. Puckering tartness with big green apple flavor. After that it's just syrupy sugar. Medium thickness with low carbonation. It's not horrible, but it's not the best example of a guezue either. Capped and corked 12.7oz bottle poured into a tulip glass. Pours a unique brownish amber color with a small white head. The aroma is slightly sour and extremely sweet smelling with some woody notes and grapes and raspberries rounding out a very sweet and fruity nose. The taste like the aroma suggests is very sweet and fruity which can be cloying at times, with a touch of sourness in the finish. I have a hard time reviewing these types of beers. They are pretty decent for what they are, but I have a hard time reviewing them alongside beer, because to me they are so different than beer they almost should not even be in the same category. Overall, this is a pretty decent brew that is highly refreshing. The main detracting quality from this beer is its high amount of sweetness that can be cloying. This really is not that horrible as a drink, but it is about the last thing that comes to mind when I think of a beer (malt/wheat and hops). Appearance: (I drank this from a wine glass) Pours like a mildly carbonated apple juice with a slight ruby coloration. There is absolutely no head or lacing in the glass. Smell: Tart apple/cherry with a light woody scent. Taste: Subtle taste of dark cherry, apple in a wine-ish atmosphere. There is definitely a candy flavoring going on inside my glass. As it warms, there is a taste that I can't narrow down whether being cork, or maybe a slight cask taste, or a mild tobacco. This is also a bit more sweet than most Gueuze beers. Mouthfeel: Thin-bodied and very light on the carbonation. Drinkability: Enjoyable in a different way, but I wouldn't want more than one of these a year. Definitely worth a try. On the 100 point scale I'd give it a 75%, C average. 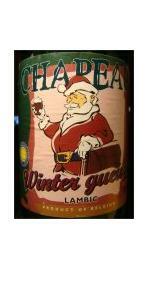 I think this is worth a try and a beer to add your holiday season "to drink list!" A: The look is the best part of this one. Pours a nice ruby read with a big bold three finger head. The head dies to a nice collar with nice sheet lacing all the way down the glass. S: The aroma is strange to say the least. A bit of funk and cherry/raspberry sweetness. There is an underlying strage aroma as well keeping if from being a 4. T: Holy mother mary of god. This thing is all over the place. Tons of sweet fruits up front. Hints of cherry and raspberry stand out. In the middle a stange cooked veggie taste comes in. Almost a mix of cabbage and broccili. Strange to say the least. The taste is like wet hay. This one starts strong but goes to hell in the middle and finish. D: You would not want much of this one. To be honest it's downright strange. Two year old bottle. Poured into a Sam Adams Perfect pint glass just because. Tainted cork reeked of vinegar & fish sauce. Thin, hollow layer off-white head atop a slightly reddish, but mostly amber brew. Managed to keep most of the sediment out this time as well. Smell is an odd combo of green beans, wet leaves, cherry juice, adhesive, & hard/stale water. Taste is basically cherry syrup & boiled vegetables, with a splash of apple cider vinegar. A saccharine sweetness, sort of like what you find in Duchesse. Light acidity & a mild bitterness akin to that buzz your throat gets when sucking on pesticide laden fruit. Constantly frothy, but nearly flat. Somewhat syrupy. This isn't the worst thing in the world. It's just not brewed with you in mind. Still doesn't make it any good. Pours orange brown with a white head. The aroma is very odd and not too good. This beer smells exactly like French's Yellow Mustard. You also get a little cherry or strawberry. The flavor is similar, only sweeter. Picture a sweet mustard with a little cherry thrown in. Thin mouthfeel and medium carbonation. 12.7 oz bottle, capped and corked, served in a snifter. Bottle has a thick coat of sludge in the bottom; several chunks got poured despite my effort to avoid this. The beer remained clear, nonetheless, with the chunks and pieces on the bottom; so no harm done I believe. S: very tart but over-ripe fruit; a strong, off-putting aroma of decayed wood; earthy and funky. T: Both sweet and tart.Even worse that the aroma, but not by much. Altogether, rather unpleasant funky and medicinal flavor featuring wet wood, green apples and very old light-colored fruit juice. M - medium body; low carbonation -- undercarbonated. O - Gueuze is a variable style with which I have little familiarity. That and the poor quality of this brew led me to think I had a spoiled bottle ... until I saw other reviews with similar reactions. A particularly poor Belgian - Avoid! Happy to finish the brew so I can pour out the remainder and cleanse my palate with a good beer. O: the aroma was nice but the taste...not so much. Terrible balance, bad example of style. Thanks to Bobby as I finally wrap up the torture that has been the Chapeau lineup of lambics. A: The pour is a dark amber sort of color, much darker than pretty much any other gueuze that I have come across. S: A strong fruity smell right away with some plums, cherries, and strawberries. Underneath some weird mix of tobacco and herbs, along with some wet wood and earth. I don't dislike any of these aromas individually, but they just don't work all that well in concert. T: A distinct bile/vomit flavor that I just can't ignore. The fruits are there again, but so is a strong herbaceous character (pine or rosemary?). Intensely sweet and sugary, just like so many other Chapeau beers. M: The body is medium, and a bit sticky and syrupy, with a moderate level of carbonation. D: I don't have too much else to say about this other than the flavor is just completely off-putting. As is any beer with a strong bile component. I can't resist reviewing this beer. Let's just summarize and say yes, it's very, very sweet. However, there are some real redeeming qualities, as long as you don't expect a tart, sour traditional lambic or gueuze. Pours crystal clear medium copper orange with no head at all. Very clear and nice looking. Nose is burnt bananas and over cooked stone fruit with a strong orange candy undertone. There is a sweet tart undertone, highlighted by the sweet tones, not the acidic tones - but they are there. Not unpleasant, as long as you're ok with sweet. Mouthfeel is very clean, almost refreshing, lightly tart, lightly acidic and with almost no carbonation. Not bad at all. There is a pleasant sweet fruit vinegar acidic mouth feel. Flavor profile is the real issue here. I think I'm tasting a newer or well stored bottle. There is some oxidation but in a good way. The primary flavor profile is very sweet, thick and assertive cooked apricots or strong apple juice or cider. Flavor profile is like a sweetened compote of stone fruits. It's actually very nice, unless your expectations were for a tart/sour lambic or gueuze - that this is not! There are hints of tart and hints of sour. But, truth be known, this tasted like a lightly carbonated cider; apple or apricot cider. Lightly oxidized apple juice is the pefect description and I don't find it offensive or bad - just not typical lambic or gueuze. Real question is what did the brewer intend? If brewer wanted traditional - no success; he he/she wanted a sweet and somewhat refreshing relatively low alcohol pleasant drink- then success. You be the judge. I'd drink it cold and as a refreshing sweet "juice" drink. 12.7oz. capped and corked bottle poured into a tumbler. (A)- Pours a dirty cider-brown color. Some white bubles. (S)- Lots of cider-like apple aromas. Some funky earth and lactic bits. Very very earthy. (T)- Is this a gueuze? Its is very fruit/spice forward with lots of apple/grape flavors. Little to no sourness or acidity. . . or oak even. (M)- Very minimal carbonation level; practically flat. Little to nothing sour or acidic; just fruits. . nothing to remind me of a gueuze really. (D)- For a gueuze, this really is a mess. For a fruit beer, its still not really even that good. Sorry to say this is an epic fail and do not waste your money on it. Whoever thought this was a gueuze needs to get his/her brain checked. OK: as a Belgian connoisseur I recognize that lambic/gueuze's are a breed all their own, but even so....too sickly sweet, too much of a poseur for my liking. Glad I tried--to rule out for future sessions. S-smells fairly tart. candy sugars. green apple, caramel, and winter spices. good strength! T-comes in tasting like caramel apple flavored candy....definitely not of very high quality. it then gets a roasted nut flavor that seems to last as an after-taste. all in all, its of low quality and tastes....kinda gross. M-resembles juice more than any style of beer. O-gueuzes range from gross to beautiful, this is sadly on the lower end of that spectrum. its fresh too, so i know its not a spoiled bottle. it just has too many gross flavors and the mouthfeel is just terrible.